Does your lawn look a bit neglected? Is it overgrown and you lack the time or energy to mow it? If so, please do not hesitate to call our company and book our professional and second to none here in Canary Wharf grass cutting service. We are offering you to book the best service and the best gardeners to do this job for you. Let us help you and take this burden off your shoulders. We will send you a team of our amazing gardeners to cut your grass for you. Did you know that with regular maintenance and care your grass can get thicker? Yes, it is true. And you can feel free to hire our grass cutting service for regular maintenance, for as often as you need to. Our gardeners are flexible with appointments. We use modern gardening equipment and the latest lawn mowers. Our grass cutting service includes all of your grass areas – lawn, side yard, back yard, edges, around trees and fences, etc. Our gardeners are detail-oriented and will not miss cutting a single blade of grass, you can count on that. Our gardeners will evenly cut your grass, and with their modern machines they will be able to cut on the down time as well. So, if what we are offering sounds appealing to you, do not hesitate to call us right away. 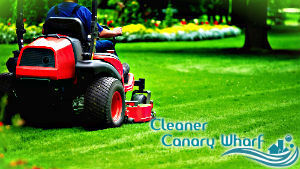 Our company is offering you the best grass cutting service you will find in E14 Canary Wharf for a very convenient price. If you know what is best for your lawn and garden, you should call us now.